Monday: All three players have cleared waivers and can be assigned to the minor leagues. Sunday: The Los Angeles Kings have come to the same decision that the Montreal Canadiens made earlier this season, and have placed young forward Nikita Scherbak on waivers. He’ll be joined by Jordan Schmaltz of the St. Louis Blues and Chris Wideman of the Florida Panthers according to Elliotte Friedman of Sportsnet. Scherbak was claimed by the Kings in an attempt to add some more speed and youth to their lineup in a hope that it would create more offense, but the 23-year old winger failed to do so through his eight games in Los Angeles. Scoring just a single goal, Scherbak struggled to adjust to his new team and will now be available for the entire league once again. If he clears, Los Angeles would be able to send Scherbak to the Ontario Reign and keep him in the organization. St. Louis too is hoping to sneak Schmaltz through and send him to the minor leagues, given the fact that he hasn’t played in an NHL game since December 14th. The 25-year old defenseman just can’t seem to crack the Blues lineup on a full-time basis, playing in 20 games this season but earning an average of just 11:29 minutes of ice time. Schmaltz was a first-round pick of the Blues in 2012, but has just five points in 42 NHL games and could very well be on his way to another organization to get a fresh start. Wideman, meanwhile has seemed to get a fresh start every few days this season. After being involved in the infamous Ottawa Senators Uber video earlier this year, he was eventually traded to the Edmonton Oilers in late November. After just five games as an Oiler, the team decided to ship him out to Florida as part of the package that acquired Alex Petrovic. Wideman made his Florida debut last night recording two shots in just under 12 minutes of ice time, but apparently did not do enough to impress Bob Boughner’s coaching staff. If assigned to the minor leagues, Wideman’s entire $1MM salary would be buried and not count towards the cap for the Panthers. When the Anaheim Ducks loaned rookie Isac Lundestrom to Team Sweden for the World Junior Championship in the midst of a campaign split between the NHL and AHL, it was a hint that perhaps the experiment was over with the 19-year-old for this season. This has now in fact been confirmed, as agent Martin Nilsson tells Swedish news source Aftonbladet that Lundestrom has returned to Sweden for the remainder of the season. Although the Ducks’ recent first-round pick, No. 23 overall last June, showed signs of promise in his first foray into North American hockey, he nevertheless had failed to produce. Lundestrom, in burning the first year of his entry-level contract, played in 15 games with Anaheim but only recorded two assists. In 12 games with the AHL’s San Diego Gulls, Lundestrom only managed six assists. After half a season with zero goals and limited opportunity to score them, Lundestrom is set to return to his Swedish club Lulea, where he played exclusively with the top team last season. After a WJC in which Sweden struggled but Lundestrom excelled, recording four points in five games, Nilsson says that the youngster is eager to return home and take on a key role for his club. He remains in conversation with Anaheim and, more likely than not, will be back with the organization to begin next season. In the meantime, the Ducks hope to see more of his offensive potential as he takes on the Swedish Hockey League. Another player who could be on the move soon is Montreal Canadiens forward Charles Hudon. Marc Antoine Godin of The Athletic recently sat down with Hudon’s agent, Allain Roy, and discovered that the young forward has asked the Canadiens to give him a chance to play. While Godin would not go so far as to say that Hudon demanded a trade, the 24-year-old did allegedly tell the team that he wants a chance and, if it isn’t in Montreal, he would like to be moved elsewhere. “Charlie wants to play in the National Hockey League”, said Roy, “He’s a good player, and we’re still waiting for an answer whether it’s from Montreal or anywhere else.” After a 30-point performance in his first full NHL season last year, it’s fair for Hudon to be discouraged with how this season is going. Expected to be top-nine contributor, Hudon has instead been a frequent scratch and has played the majority of his 23 games on the team’s fourth line with Matthew Peca and Nicolas Deslauriers, despite ample opportunity to line up elsewhere. The trio has combined for just 17 points and Hudon has only contributed four. The Canadiens have opted to hold on to Hudon rather than risk him on waivers, even at the cost of recent claims Nikita Scherbak and Jacob de la Rose, but continue to deny him an opportunity to succeed. Godin wonders what the market would look like for a player like Hudon, whose size and skill set are ill-fitted for checking line work but who has yet to truly prove himself as a top-nine scoring option. Hudon would most likely not clear waivers if any team could grab him for free, but will anyone be willing to ante up to acquire the eager winger from the Canadiens? If the team doesn’t start giving him a larger role, we’ll soon find out the answer to that question. Already on his way to a new team is Tye McGinn. Unlike Jamie and Brock, the middle McGinn brother is without an NHL contract this season for the first time in his eight-year pro career. McGinn, 28, had been playing for the AHL’s Manitoba Moose, affiliate of the Winnipeg Jets, but yesterday was traded to the Chicago Wolves, affiliate of the Vegas Golden Knights. This ended up being the “future considerations” side of the Jets’ acquisition of defenseman Jimmy Oligny from Vegas. With the Knights looking playoff-bound again this season, the McGinn acquisition could yield an intriguing late-season signing option. The team is sure to take a look at how the veteran two-way forward performs for their farm team and could decide he is worthy of stashing as a deep depth piece for the stretch run and postseason. McGinn was last an NHL regular in 2014-15, but has always produced consistently in the minors and shown good checking ability at the next level. Vegas has only two roster spots open as of now, but depending on how their trade deadline plans shake out, could dedicate one of those slots to McGinn later on. This is the second high draft pick the Canadiens have lost on waivers this season, following Detroit’s claim of Jacob de La Rose earlier in the year. Scherbak was selected 26th overall in 2014, after exploding onto the CHL scene as a rookie for the Saksatoon Blades. His minor league career was also quite successful, but the 22-year old forward was unable to crack the Montreal lineup on a regular basis and faced injury this season. The Canadiens did try to trade the young forward, but with their obvious roster crunch approaching teams likely just waited them out. For the Kings, this is a worthwhile gamble given the performance of their own forward group this season. Los Angeles ranks easily last in the NHL in scoring with just 56 goals through 26 games, an amazing 47 fewer than the league-leading Tampa Bay Lightning. While their goaltending and defensive play has been good enough to keep them from being shelled on a nightly basis, expecting to win while averaging just over two goals a game is impossible. Scherbak doesn’t offer a guaranteed upgrade to that group, but at least has a healthy dose of potential left in him and could just be waiting for an opportunity. CapFriendly reports that Scherbak will remain on injured reserve for the time being, but the Kings will likely try to get him into the lineup as soon as possible. A restricted free agent at year’s end, he should get every chance to prove he can be a useful contributor going forward, deserved of a new contract. The Canadiens have placed winger Nikita Scherbak on waivers, Sportsnet’s Elliotte Friedman reports (Twitter link). Sportsnet’s Eric Engels adds (via Twitter) that Montreal had unsuccessfully tried to trade him before going this route. The 22-year-old made the team out of training camp but didn’t see any action before being sent to the minors on a conditioning stint at the end of October. He got into five games with AHL Laval and struggled, picking up just a single goal in that span. Scherbak also suffered a lower-body injury in the minors and was placed on injured reserve following his recall. The fact he’s on waivers suggests he’s cleared to return. Scherbak was a first-round pick of the Canadiens back in 2014 (26th overall) but has yet to have much success at the NHL level. He played in 26 games with Montreal last season, recording just six points while spending a lot of time in a bottom six role. As an offensive-oriented player, he’s someone who is best served playing in the top six but he hasn’t had that opportunity on a regular basis just yet. Given the offensive potential he has shown at the minor league level, his age, and the fact he’s on a cheap contract (he’s in the final year of his entry-level pact with a cap hit of $863K), there’s a good chance that he will be claimed, similar to what happened on Friday with winger Valentin Zykov joining the Oilers. If he passes through unclaimed, he’ll be sent back to Laval. 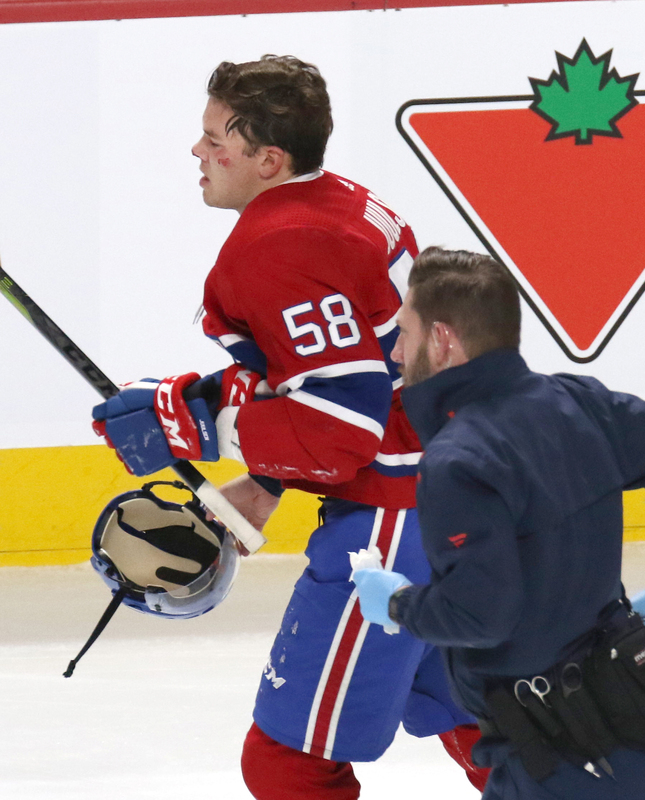 Perhaps even worse than the news on Byron is that of Joel Armia, who suffered a knee injury against the New York Rangers on Tuesday night. Armia will be out for six to eight weeks, meaning he very well could be out until after Christmas. Armia had seven points in his first 15 games and had logged time on both the powerplay and penalty kill this season. That versatility will be sorely missed over the next couple of months, especially if Byron can’t come back soon. Tomas Plekanec, who has played only three games this season, is getting closer to a return but isn’t the type of player who can make a huge impact anymore. What these injuries might mean is another chance for Nikita Scherbak, who has been playing on a conditioning stint in the minor leagues. As CapFriendly noted yesterday, the Canadiens can keep him in the minor leagues for another few days but will have to make a decision on what to do with him at some point. The team already lost Jacob de La Rose when they tried to sneak him through waivers, and wouldn’t want to risk Scherbak to the same fate. They’re getting into a bit of a crunch here where they’re going to have to move some bodies to the minors, and some of those guys require waivers. So I guess Bergevin is just testing the waters to see what interest there might be in some of his guys and could he get something instead of instead of losing someone potentially on waivers. Even before de La Rose and Deslauriers come back the Canadiens find themselves with 14 forwards on the roster, and only star rookie Jesperi Kotkaniemi is waiver-exempt. Unless they decide to send Kotkaniemi away to continue his development somewhere else, the team is already sitting players like Tomas Plekanec on a nightly basis. That’s not ideal, but the team also doesn’t have a lot of leverage with other clubs knowing they’ll have to put someone on waivers eventually. If the team can get something for one of their depth forwards, it likely won’t be a big return. de La Rose and Nikita Scherbak, who can’t seem to find a way into the lineup either, are both high draft picks that haven’t quite worked out to this point. Still, a 22-year old first round pick that has only played 29 NHL games and produced well at the minor leagues has to have a little bit of value, if the Canadiens decide that Scherbak is the easiest one to deal away. The decision still probably doesn’t have to be made for a few days, but expect some movement in Montreal in the near future.